There will be medical screenings from 7-9 and the 5K will start at 9. 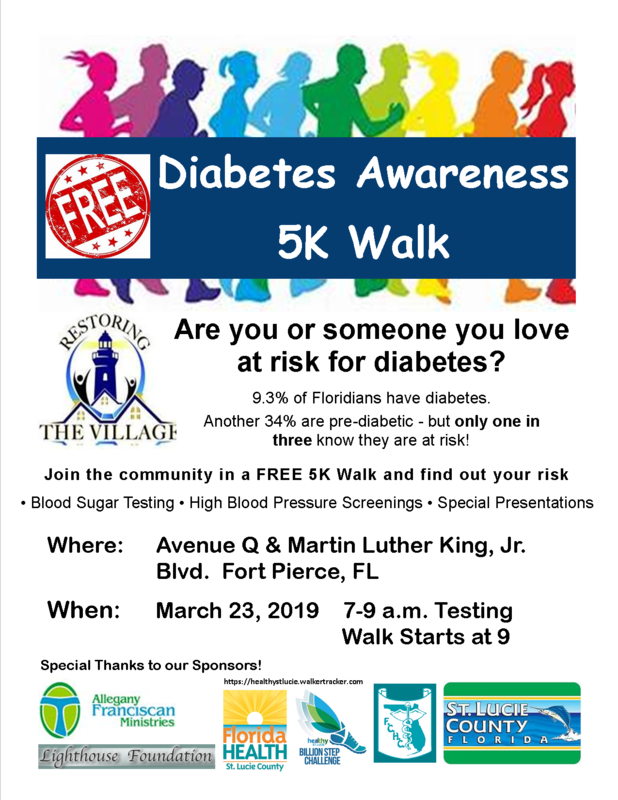 Restoring the Village, an initiative of The Lighthouse Foundation, announces the “Diabetes Awareness 5K Walk” on March 23rd, 2019 in Fort Pierce Fl. This effort is designed to create awareness, provide early detection screening and treatment information for diabetes in our local community. The walk will begin and end at 25th street and Ave Q in Fort Pierce, Fl. Free diabetes and hypertension screenings kick off the walk from 7-9 am, featuring local endocrinologist Dr. Paul Graham. This awareness walk is in collaboration with The St. Lucie Health Department, Allegany Franciscan Ministries, Florida Community Health Centers, Inc., the City of Fort Pierce and Police Department, Sheriff's Office, Healthy St. Lucie Billion Step Challenge, and more.